Woke early today with community board abolition on my mind. The Royal Commission fundamentally undermine their opposition to community boards with their arguments in defence of community boards being retained at Waiheke and Great Barrier. In terms of character, difference, history and heritage, Devonport is as much an island in the North Shore, as Waiheke is in Auckland. Half a metre rise in sea level and Devonport will actually be an island - can it have a community board then? There are other parts of Auckland just as special as Waiheke. We must not lose them or their potential, through failure and absence of governance, just because they are not surrounded by the sea. That sounds positively archaic. When Peter Salmon - Chair of the Royal Commission - announced its recommendations, he made much of the duty of proposed Local Councils (Urban ones in the city especially), as being "place making" or "place shaping". That's about urban design, streetscapes, local colour, detailed planning. Stuff like that. Devonport Commissioners (Community Board members do this) consider all resource consent applications that break the rules. These are consents for building activities with adverse effects that exceed the rules in the District Plan. These involve real people who live in house and work in buildings. But they also involve their neighbours. This stuff needs genuine local care. It's at the heart of "place making". Trying to stop the Devonport Recycling Depot being flogged off by Council for other purposes, when local people use it for green waste, for rubbish transfer, and as a place to buy garden stuff locally. For "place making". Making sure that changes to Market Square (by the supermarket), and Marine Square (by the Devonport Wharf and Ferry Terminal), are upgraded as people want, and taking account of best urban design principles and ideas. More "place making". Championing the cycleway infrastructure through local parks, around the coastal edge and along Lake Road. This is real "place shaping" stuff, and without Devonport Community Board it simply would not have happened. Council was the fly in the ointment on all these projects. Community Board input and advocacy was critical. Under the Royal Commission's recommendations, Devonport would by lucky to have one councillor to act for it's interests on the new Waitemata Urban Council (the proposed council transformed from North Shore City Council). It will have its own higher level urban place shaping requirements to tend to - such as the Busway, Bus stations at Browns Bay, Takapuna, Glenfield - parks, integrating Hibiscus Coast into its planning. And so on. Setting that aside, across Auckland there are highly developed and special places. Property values are high there. Families and people want to live there. The sense of place, the opportunity for further "place shaping and making" is tangible. It is also precious. People and communities value it - both financially (they are prepared to pay the higher property prices), and spiirtually (these places have soul). I don't know all of them. Of course we know about the soul in Waiheke, and The Barrier. But it absolutely exists in Devonport, Highbury (North Shore), Grey Lynn, Mount Eden, Remuera, New Lynn, and Onehunga. These are local communities and high functioning community boards I know something of. There is something about these types of communities and how they develop in the future that is seriously threatened by the prospect of community board abolition. These communities are what give Auckland its diversity - at local level - and character. I think, before the baby is thrown out with the bathwater, that those who advocate most strongly for their retention, need to construct some metric or set of criteria and thresholds that will enable selected community boards to be retained, and for new community boards, at a later time, to be established. So. What about the Royal Commision? It's been an interesting day. Absorbing the Auckland Royal Commission's report - well - the Executive Summary, listening to comment, watching TVNZ's report, and we had an ARC Council briefing at 2:30 today. It's been enlightening. But there's still a few clouds over Auckland with these recommendations. My first positive thoughts were these: good to see regional governance strengthened; good to see second level of local government retained with entities based around the existing North Shore, Waitakere, Auckland and Manukau City structures, and Rodney District, and Papakura combined with Franklin. And it was interesting to see the approach to Auckland City: separate Auckland CBD and Waterfront and give special treatment through direct governance by Auckland Council, and local input through an Auckland CBD and Waterfront Community Board. That would be a doozey of a community board to be on! But I was disturbed to see Community Boards generally abolished - except for the obvious examples retained at Waiheke and Barrier Islands. I was also disturbed to see the recommendations regarding Auckland City Council mayoral power. I don't think Auckland is ready for that sort of executive power at all. power to obtain independent advice. That's a lot of powers! The degree of centralised decision-making, and the lack of grassroots local government is the main concern I have. This is not the same as the model advocated by ARC: "the one and the many". This is: "the one and the few", but without the truly local. The functions of the local level of local government that have been proposed by the royal commission - essentially as the local delivery point of centrally governed services and policies, and with a strong responsibility for being Auckland Council's "ears and eyes" into the local community - means that it will be difficult for that role to be further decentralised. It might make sense for Area Offices to be maintained throughout each Local Council Area. But that might be thought wasteful. The challenge - I think - is for those supporting the abolition of community boards to demonstrate that the functions today of good and well-functioning community boards can be well provided by the proposed local councils. Conversely - those wanting some form of community board - or equivalent function - to be retained need to argue why, and also how that might happen. Difficult. But unless this is done well and responsibly, there is real risk here of the local baby being thrown out with the regional governance bathwater. stuff about the waterfront like: an emphasis on urban design, management and planning; that future waterfront development be done by an agency with a masterplan - "as opposed to the present piecemeal approach" - hooray! that Auckland council is to appoint a parks ranger responsible for volcanic cones! that the 6 local councils (4 urban, 2 district) won't have elected mayors, they'll appoint chairs. that North Shore City will become Waitemata and include the urban developed Hibiscus Coast part of Rodney (basically Whangapaoroa (sp?) and Orewa, and encompass the Busway from Takapuna through to Silverdale). that elected councillors will be prohibited from being appointed to CCOs (like Auckland Regional Holdings, Watercare, RTA (made from ARTA), the proposed Urban Development Agency etc). that local roads will still be controlled by Local Councils as they exercise their "place making" or "place shaping" roles. particular recognition is given that stormwater management need to be shared between Watercare and the Local Councils. This is a complex issue. that Auckland Council should develop a regional waste management strategy, including for organic waste, and integration of waste management with other encironmental programmes. About time I say. Anyway. While I can get excited about this stuff, at the moment it's only a set of recommendations. Though the Royal Commission has also gone to the trouble of drafting legislation to implement its recommendations. But it won't happen until Government enacts the required legislation. Do you think Government will want an Auckland Mayor as powerful as London's Mayor of Greater London Council? Depends which Party puts him/her in there I guess. But that's a political lottery. When I was in Curitiba Brazil I met Jaime Lerner - the famous ex-mayor of that city. Did some amazing stuff. Had huge personal power. But that was South America. And London is very established. Auckland is in between. I don't think it's ready for the sort of individual mayoral power that the commissioners would like. Thank you ARTA and Auckland City for India Vs Black Caps! I was lucky enough to go to the cricket on Saturday with a mate. What a fantastic night. We started with the ferry trip across from Devonport. Then at Britomart we were informed by the smiling asian woman at the ticket office, that of we showed the ticket inspector our tickets, the train to Kingsland Station would be free. Coffee and pastries in hand, we assembled on the platform among a happy and highly prepared bunch of Indian cricket groupies. Faces painted with Indian flags. We were outnumbered. Quick trip to Kingsland station, out the door, onto the street, highly organised, good humoured and efficient pedestrian management. And we were there. Indian flags and painted faces everywhere. The fans were everywhere. We took our seats in the stadium which was filling up, and it was like being in a busy, noisy, colourful India street. What a buzz. Everytime a face went up on the big screen, or a blue uniformed cricketer did some training on the group - the roar went up. And then there was the big game, with 6's and 4's for Africa (India and New Zealand). Reminded me a bit of being at Cardiff Arms a long time ago - I was there when the AB's won 13-12. Such a passion for their sport. An unaggressive passion. The newspapers and TV are full of the results. The Black Caps won. Back on the street - to go home. The feel of Kingsland Station - with the Taiko takeout so near, and the neon beckoning other attractions up the street nearby, the co-location of heritage buildings, everything close. I had a glimmer of how many other parts of Auckland could be - if we keep working at it. Make that public realm by our rail stations really work for pedestrians, ensure there is a mix of activities. Good access and street amenity. We got on the train with a group of youthful Auckland Indians. They seemed to be using the train for the first time. Didn't know it would stop at Britomart and we'd all tumble out. Which we did. They were delighted they hadn't had to pay. Felt a bit guilty. Muttered, "thank you" to the guard as they bounced up the platform ready to continue their night in the CBD. Thank you ARTA. That free train service was great. Appreciated. A present for Auckland. Maybe you should let people know it was deliberate - not a case of not enough ticket collectors! And bits of Auckland are showing we can do really attractive urban design. Thank you Auckland City Council. 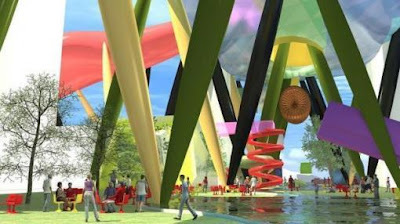 I was invited to attend the Ignite Architect's evening out (26th February) with world renowned architect Will Alsop. Billed as a discussion about the adverse effects of the RMA, and an opportunity to see the concepts for Britomart and Waterfront put together by a collaboration of Ignite staff and Will Alsop. We were treated to pictures of some of Alsop's stunning architectural achievements. You get the flavour from a selection I have pasted in here. When he applied himself to Auckland, several things he said stuck in my mind. "You have no big public place for people to congregate and celebrate. Where are you all going to go when you win the Rugby World Cup? Where will you gather?..." He didn't refer to Aotea Square. Funny why that space doesn't really work. OK for the Friday Market. But bleak otherwise - apart from the wonderful Maori gateway. It has very weak edges - using urban design speak. They are unqualified. Especially the Aotea Building itself. It presents a very cold and unfriendly exterior. I won't mention the Council building. Unspeakable. And the edge of the entertainment complex is a strip of what Auckland does well. Bars. "And then there is the Red Fence. I am told we can't go past that. But why wouldn't you want to? It's where people really want to go. In my experience if you want to develop public places down by the waterfront, where the Port company has been, you need an Act of Parliament. Ports Companies have too much power..."
I have to agree with him. Even today we see on the front page of Herald a news article where the Auckland Port company - 100% publicly owned - wants a "capital restructure", and then to flog itself off to the highest private bidder. Fantastic. Just because it's going down the fiscal gurgler is no reason to pass off to the private sector all that waterfront land. Auckland would be richer if Ports simply gave itself back to the public, rather than selling itself on the open market. Then sticking out the Northern side of this elevated building would be: a library (in a sort of elephant's trunk shape extending between existing heritage buildings and running out above Quay Street to a place vertically above the red fence), and hotel (in a different sort of elephant trunk shape, located a block away from the library, but also running out to the red fence). Radical. Hard to get the presbytarian approach of Auckland to engage with that. Maybe. Alsop was very strong on the need to engage the public in this process. I agree. The Britomart Railway station was itself a very public design process. Whereas what we have seen for TankFarm, and for Princes Wharf, have been behind-the-scenes revenue maximising activities. Needs to change. Thank you Ignite for a bit of stimulation and that kick in the bum. One of the outcomes at North Shore City Council of all the hot air and incendiary letters that ensued, was that it decided to review North Shore City's Cycle Strategy. That strategy was put together by a previous council - one a little more representative of the interests of cycling and of pedestrian oriented development and other modern ways of thinking about urban development and transport. It is essential - I think - that a good number of thoughtful submissions are made. The strategy is being reviewed now. Submissions close on the 16th of March - a week's time. Strategy 1 - Develop safe, convenient and quality cycle networks and supporting facilities to meet cyclists’ needs The provision of safe, convenient facilities for cyclists is paramount in encouraging people to change their travel behaviour. People must feel safe and know they can get to their destination easily. This strategy provides for the development of the cycle network (strategic and local) through cycle specific projects and other road improvements, and supporting facilities such as parking, learn to ride facilities, hand rails and integration with public transport. incorporating Austroads documents and guides from Transit NZ, Transfund and the Land Transport Safety Authority. It also provides a comprehensive process for delivering the best solution on a case by case basis, recognising that each situation is different. Best practice design guides also apply to urban design and safety guides and Land Transport Rules. This chapter also outlines enforcement in terms of ensuring appropriate behaviour from motorists and cyclists. Strategy 3 - Maintain cycle infrastructure to a high standard. Once facilities are in place it is important to ensure that they are kept up to standard and updated where and when necessary. This strategy outlines the cycle facility maintenance plan. Another important facet of maintenance is monitoring and evaluation – ensuring that the facility or programme is achieving the goals of this Cycling Strategy. North Shore City is following the lead of the Regional Cycle Monitoring Plan in its monitoring and evaluation programme. maximise the number of people using the cycle facilities provided around the city, a programme is required for promoting cycling as a safe and efficient way to get around. This strategy provides for the ongoing implementation and development of programmes such as the TravelWise school programme and the workplace travel plan programme, which are important channels for promoting safe cycling to people travelling to school and their place of work. The Council will also continue to promote cycling through cycling events, community based programmes, neighbourhood accessibility plans, personalised journey plans and by supporting promotional activities initiated by other organisations. Strategy 6 – Improve the coordination of efforts amongst groups affecting cycling. The provision of cycle facilities and programmes is progressed by many different parts of North Shore City Council. This strategy seeks to develop processes and structures to maximise the efficiency of these different parts of Council and ensure the successful delivery of this plan. The main driver for coordination will be a cycle steering group made up of relevant Council officers. This group will monitor the implementation of this document and report back to other Council departments and external organisations and groups. Strategy 7 - Ensure that where possible, adequate resources are available to implement the Cycling Strategy Resources are required to action the strategies outlined above. This strategy puts in place the processes required to ensure that, where possible, this funding is available from all obtainable sources – in particular from the New Zealand Transport Agency and North Shore City Council itself. I recommend you make a submission. Do the vision statement and goals reflect your vision and goals for cycling in North Shore City? : Yes. Strategy 1 is supported. Safety is paramount to deliver the vision. If people don't feel it is safe to cycle on North Shore, then this effectively means North Shore City does not "encourage cycling as a mode of transport..."
Strategy 2 goes too far, in my opinion, in emphasising "best practice cycle design guides to cycle networks and to cycle facilities". It is more important now to be re-allocating road space to cycling (by setting it aside with white painted lines for example), and by removing the right to park cars in the road reserve. It is also more important now to be working with Parks Dept (and ARC's Parks Dept) to allocate space within parks and reserves for green cycleroutes - which can connect with road cycleroutes. Then later, as demand and acceptance grows, then resources can be allocated to improving the standard of cycleway infrastructure. It is better to have a safe cycling network that is less than perfect, than it is to have a few short sequences of cyclepaths which are world class, but which don't connect, and lack utility. Strategy 3. My response to this is similar to Strategy 2. What is important to cyclists is that cyclepaths on road reserves are swept regularly, and are kept clear of glass fragments and other detritus that can make cycling unsafe or unreliable. It is better that existing cyclelanes are kept functional, rather than money being wasted keeping them beautiful. In cash-strapped times the priority needs to be utility and safety - rather than perfection. Strategies 4, 5 and 6 are essentially motherhood and apple pie. It is good to do these things. It is good for NSCC to be walking the talk. It is also appropriate for NSCC to act consistent with its vision for cycling on the North Shore. Strategy 7. I don't support the caveat "where possible" in this strategy. NSCC has a duty to deliver multi-modal transport infrastructure. There is clear direction from all levels that Auckland, and its sub-cities, need to do far more to encourage land use settlement patterns, and urban form which "encourage cycling as a mode of transport...". Just as NSCC has promulgated Plan Changes 22, 23 and 24 to require much greater responsibility on the part of land developers to ensure that stormwater effects are minimised etc, then in the same way, NSCC needs to be ensuring that its District Plan guides and shapes land use patterns which will genuinely "encourage cycling as a mode of transport" - ie that people are encouraged to use a bike for local errands, shopping, going to school, going to work etc - rather than feeling actively discouraged to use a bike by land settlement patterns, absence of safe lanes, and large physical distances between land uses, limited mixed uses etc. Thus - NSCC has a duty to financially support cycle infrastructure development, but it also has a planning duty to ensure that land use patterns also "encourage cycling as a mode of transport". As an ARC councillor, I am keen to ensure that Regional Planning and TLA planning is well integrated and coordinated. Am happy to come along and talk about this, or/and facilitate sharing of ideas with ARTA. In particular, my comments in regard to Strategy 2 and 3 indicate that the priority now is to establish NSCC cycle path networks (that don't need to be gold-plated). Cycle infrastructure needs to be connected and joined up. PM Keys initiative for a national cycleway is a good opportunity for NSCC to share this popular vision, and engage over how this path might integrate with North Shore cycle infrastructure. It is important for North Shore's economic future and tourism, that North Shore is part of this initiative. Don't you think it's fantastic that the Prime Minister of a National Government should advocate for a cycleway the length of New Zealand? I certainly do. 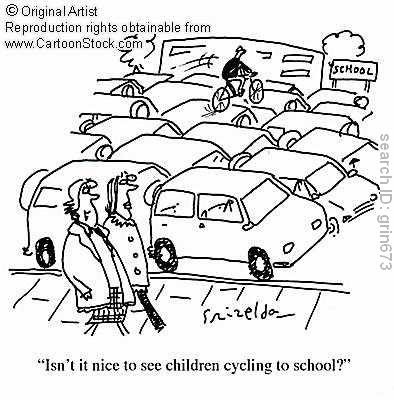 Key's enthusiasm for cycling should surely make all those who whine about cycling being for masochists, and on and on, many of them unreconstructed petrol heads, to think twice. Choice is good - they might even think. But I do have a little note of concern nagging - being a few days away from booking my own family cycling expedition on the Otago Rail Trail. You might recall that this very same National Government has let out a few squeaks about certain bits of the NZ rail network being unprofitable - as if any railway - or indeed any motorway - is actually profitable (when you add all the true costs up). There might be a little agenda here. Imagine if it was proposed that those railways should be ripped up to form the spine of a national cycleway - like the Otago Rail Trail writ large.... You can almost hear the comment: "we can kill two birds with one stone here..."
Setting that possibility to one side, I think a national rail trail would set cycling solid into NZ's national psyche. A bit like a cycleway across Auckland's harbour bridge would. Everybody would want to connect to it - especially towns and cities along the way. It would be the trigger for the establishment of a nationwide network of cyclepaths. That is an outcome NZer's and tourists would love.